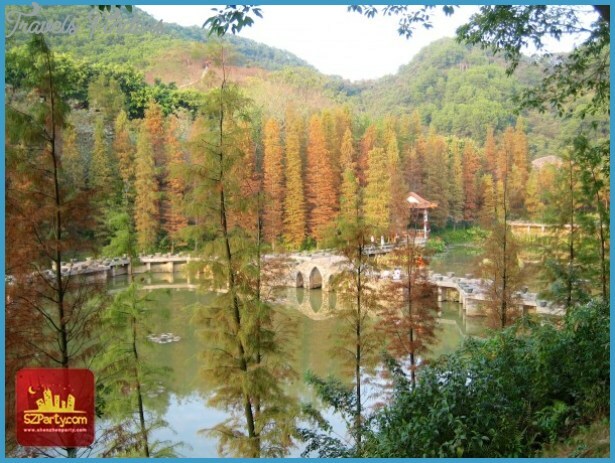 This is the tomb of the last Emperor of the Southern Song dynasty, Zhao Bing, known as the Xiang Xing Emperor. It is situated in Chiwan, which is directly behind the Shekou container terminal. It consists of a typical Chinese middle class horseshoe shaped grave. The grave is surrounded by flags, which have been donated by people whose prayers to the dead Emperor have been answered. 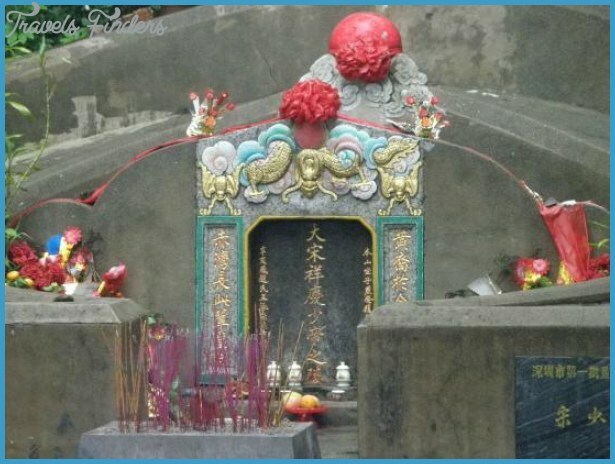 The grave was discovered in the late nineteenth century as a result of the researches of the Chiu in Mandarin Zhao clan in Hong Kong Zhao was the Song Dynasty Imperial Surname and many members of Zhao clans in the Hong Kong-Shenzhen area claim Imperial descent. It was restored by public subscription. Then with the wars and confusion of the twentieth century, it fell once again into disrepair. A People’s Liberation Army cook who was rummaging amongst the wild bamboo for firewood rediscovered it in the 1960s, but the 1960s were not an auspicious time for discovery of Imperial remains. Finally in the 1980s, with an eye both to China’s past glory, and to better relations with Hong Kong, the City Government restored the grave. But it should be emphasised that the evidence for the authenticity of the tomb is slim, even though contemporary records seem clear that the Emperor was buried in the Chiwan area. There is quite a lot of confused information about the boy Emperor in Hong Kong. The main relic of this period in Hong Kong is a stone inscription called the Sung Wong Toi near the old Kai Tak Airport, but only a small part of the original inscription survived the airport construction during the Japanese invasion. 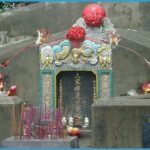 Since this tomb is the most important historical relic in the Shenzhen-Hong Kong area, we will go into some detail about the events surrounding it. The events relate to the collapse of the Southern Song dynasty and Kubilai Khan’s extension of Yuan Mongol rule to the whole of China. Until 1276, China was split between Kubilai Khan’s Mongol Yuan Empire in the north and the Chinese Southern Song Empire Marco Polo called it Manzi south of the Yangtze River. 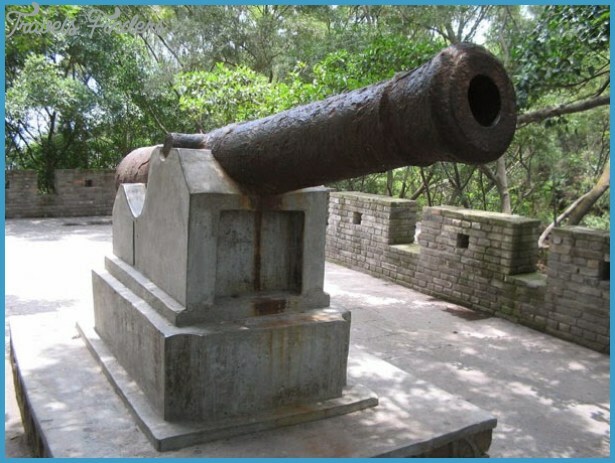 In 1276, Mongol forces attacked and captured the Southern Song capital Lin An modern Hangzhou. They captured the five-year-old De You Emperor and took him to Da Du, the Yuan capital, where he was killed. The Southern Song Dynasty was in mortal danger. The ministers of the Southern Song, Wen Tianxiang, Lu Xiufu and Zhang Shijie, fled southwards, taking the dead Emperor’s brothers, Zhao Zheng and Zhao Bing, with them. 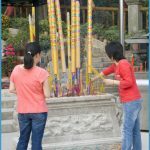 That same year, five hundred miles to the south in Fuzhou, they installed Zhao Zheng, who was nine years old, as the Jing Dan Emperor. 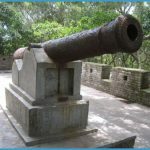 But the Yuan armies pressed on and the following year the Southern Song court was forced to flee to Guangdong where, in 1278, they established themselves in several places including Mui Wo on Hong Kong’s Lantau Island and Kowloon City. In the fourth lunar month of 1278, Jing Dan died and the ministers invested his brother Zhao Bing as the Xiang Xing Emperor. He was only eight years old. But the Mongols pressed forward and in the eighth lunar month an army of 20,000 besieged the Southern Song remnants. In the twelfth month, Wen Tianxiang, the Regent was captured. The Mongol forces won a decisive victory at the Battle of Yamen in the Pearl River Delta opposite Shekou and the dynasty was finished. The young Emperor and his retinue were besieged on boats in the Delta waters. Naval forces strengthened the siege and Mongol troops cut off drinking water and firewood. The situation was clearly desperate. Then, at the beginning of the sixth month of 1279, heavy rain and thick fog presented an opportunity for escape to Vietnam. Minister Zhang Shijie acquired a small boat and preparations were made for the Emperor’s escape. However Lu Xiufu, the Chief Minister, was afraid that the boat and the Emperor would be captured, thus bringing shame to the dynasty. He first caused his own wife to commit suicide by jumping into the sea, then strapped the nine-year-old Emperor to his back and drowned them both. This marked the end of the dynasty. The contemporary Chronicle of the Zhao Clan and Record of the Emperor Bing records a charming story about this event. It says that the body of the Emperor floated to Chiwan with a great flock of cranes settled on it. 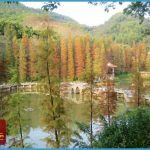 At the Chiwan Tin Hau Temple a Daoist priest was inspecting the beach when he noticed something strange, a body floating in the water with a great cloud of cranes around it. The face of the body looked as if it was still alive and it was clothed in the Imperial yellow. As it passed, a beam in the Tin Hau Temple collapsed. 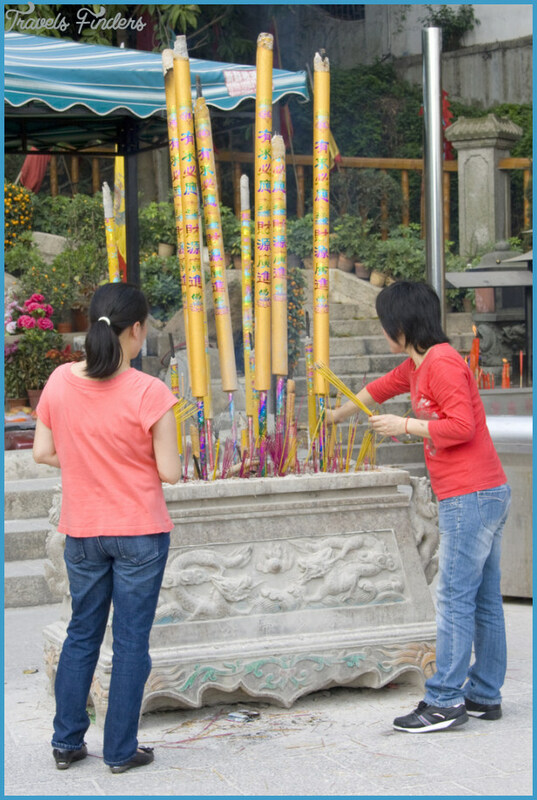 The nobles and elders of the town prayed for guidance and received the divine response that the body was Imperial and the collapsed beam was a sign from Tin Hau, the Queen of Heaven, that the wood should be used for a coffin for the Emperor. Thus the body was buried at the southern slope of the mountain. There is a tradition that the rulers of new dynasties should bury the last Emperor of the old among his ancestors with full honors. But Kubilai Khan didn’t recognize the young boy as Emperor. His mother had surrendered the dynasty two Emperors previously. Accordingly, there was no elaborate tomb or ling for him such as we see in the case of the Ming Emperors near Beijing. This is a modest conventional tomb such as can be seen on many Chinese hillsides. But it is a scene of active popular veneration. Worshippers flock to it and the containers are full of burning joss sticks. The rattle of divining sticks can be heard constantly. The excellent feng shui, which led to this being chosen as the site of the tomb, has been affected by recent building between the tomb and the sea. But it is still a pleasant spot. The only slightly jarring note is a modern statue of Lu Xiufu, the young Emperor firmly strapped to his back, getting ready to jump into the sea.